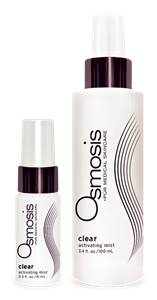 Clear by Osmosis Skin Care helps to penetrate products and stabilizes bacteria levels. Love this product !! Use it as toner and also to mix with all my Osmosis serums and moisturizers. As all Osmosis products I use, it has tremendously juvenated my skin. I love this spritzer it feels so cool and refreshing to my skin. I Highly recommend this, esp, if you have rosacea!